If you want to grow your business, sales and marketing alignment should be a top priority. Here are 3 key steps our Business Development Representative, Emily Hulstein, recommends. Organizations excelling at aligning sales and marketing teams achieve 20% revenue growth on average annually. By contrast, companies with poor alignment saw revenues decline by 4%. So, if you want to grow your business, sales and marketing alignment should be a top priority. So, what can you do to align your sales and marketing? Our Business Development Representative, Emily Hulstein, has sales and marketing alignment down to a science. Here are three steps she recommends. If you want to meet a goal, first you have to agree on what that goal is. Start with the big picture, Emily says. For example, your sales revenue goals for the fiscal year. Then, she says, “work backwards.” What does your team need to do to meet this goal? So, you’ve established your goals. How do you get sales and marketing on the same page, and keep each team accountable for upholding their end of the bargain? “You need a Service Level Agreement,” or SLA, Emily says. What is it? A deal that sales and marketing - or at least the heads of each department - sign saying what they’re accountable for. So you have an SLA. But just because your goals are written down, and tasks are assigned, doesn’t mean that your goals will magically be met. The key for success? Regular communication and continuous process refinement. To ensure that your sales and marketing teams are working well together, you’ll need to schedule regular meetings. Worried that they won’t be productive? Make sure they include these five steps. Is everyone still on the same page? Or do adjustments need to be made? Are sales and marketing hitting their goals? If not, how can processes be refined to fix this? If yes, does the team need to set more aggressive goals? What collateral is getting a lot of traction with sales? With marketing? How could one help the other? For example, Emily says, “what collateral is marketing seeing being really effective, and how can sales leverage this?” On the flip side, what questions or comments has sales been hearing a lot of that marketing could address in collateral? How can you capitalize on these trends? After the meeting, it’s time to implement any changes that have come up, and optimize for future success. “A tech stack that makes this seamless is really important,” says Emily. When marketing can seamlessly automate the handoff to sales, incredible things happen. For example, she says, using one consistent CRM, “Your sales team can be “really targeted [in their outreach] without spending too much time doing extra research.” A system like HubSpot puts prospect data at your fingertips, so your sales team doesn’t have to guess. 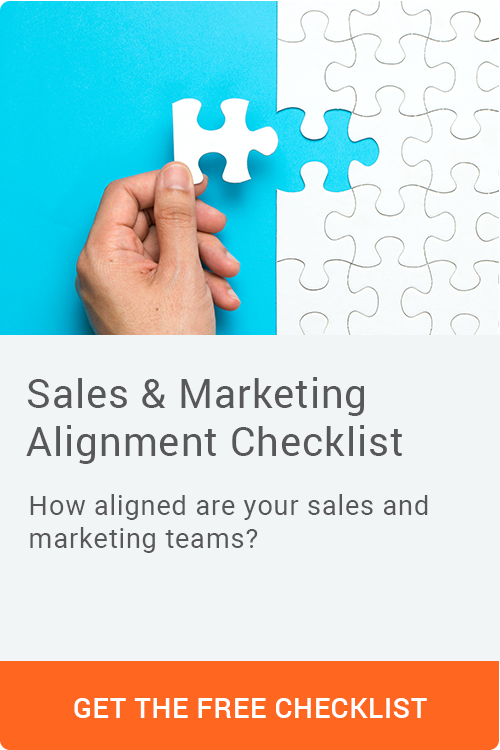 Do Your Sales and Marketing Efforts Need Alignment Work?